For their letter to the Sunday Tribune today. And to everyone else who offered private support. I am very grateful to the people who, in the wake of the article, have been in contact to express their support of my work. I’ve tried to be rational about the article and to understand the journalistic instinct that inspired it and react accordingly. Nonetheless, it does hurt and I did feel attacked. 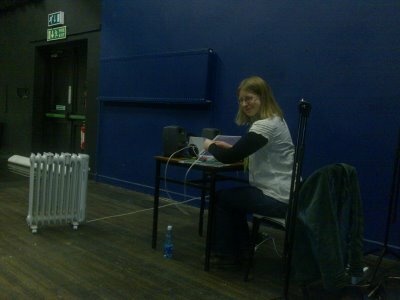 It was great, therefore, to start on a new piece today – a solo called Casadh Arís – with the composer Rachel Holstead (yes, I do work with music!). We’re in the Ionad Cultúrtha in Baile Bhúirne, in West Cork, where lots of central heating, three layers of socks and generous portions of food help us combat the cold. It’s good to be working, good to have an inspiring and open collaborator. And Baile Bhúirne is beautiful in the bright winter light. I was expecting the article. I knew some time ago that a journalist had submitted a freedom of information request to Dublin City Council to find out the details of my residency. Of course all the information was already in the public domain (how much the residency offered, how much the Arts Council awarded me) and I’ve kept this blog for anyone find out what I’ve been up to – so I wasn’t fearing an exposé. But I was disappointed by the tone of the article that implies rather than asserts that something untoward was going on. The journalist gave me an opportunity to contribute to the article so at least I was able to correct the misapprehension that I’d received €75,000 for the year, though that didn’t prevent an enthusiastic sub-editor from writing a headline that made it seem that way. I was disappointed also that the article didn’t mention the many tangible achievements of the residency. The outcomes of the investment of the Arts Council and of Dublin City Council have been very positive. I have brought dance artists from China to Dublin to create artistic links between our different cultures. The visiting artists returned to China with a high opinion of Irish work and of the infrastructure of support for the arts in Ireland. Such supports do not exist for independent artists in China and creativity is not as readily expressed as a result. Bringing Chinese artists to Dublin resulted in a new dance piece, the first collaboration ever between an Irish and a Chinese choreographer (with a Chinese composer). That work, Dialogue, will be performed again in Europe and in China in 2009. I have created a 20 minute dance film with James Kelly of Feenish Productions, The film, Three + 1, was projected on to the side of the DCC building in Barnardo Square for Culture Night. The purpose of the screening was to make the publicly funded work available to the public for free. The film will also be shown in film festivals across the world making sure the profile of Irish art is raised internationally. The funding also allowed for the research and development for a new work called Niche, that premiered to critical acclaim in Project Arts Centre last month. The funding allowed for the creation of a blog (www.bodiesandbuildings.blogspot.com) that shared the research and development process with the public, locally, nationally and internationally. The funding helped create a project that attracted media attention and feature articles (Irish Times, Irish Independent, Sunday Tribune, Herald, RTÉ) thereby raising the profile of dance in the public imagination. I was able to pay six dancers through this process who in turn spent their money in Dublin. I was able to pay other artists (director, a film-maker) , other Irish companies such as Feenish Productions, Dance Ireland, and Project Arts Centre. I was able to draw public attention to the impact of the changing urban infrastructure on the way people live their lives in the city. I was able to create high quality dance work and share it freely with a public who might not usually experience the arts in their proximity. In addition to all this tangible, measurable benefit, my development as a choreographer was furthered immeasurably by the support of both the Arts Council and of Dublin City Council. Their investment allowed me time to research and refine work of high quality. It allowed me to work with other artists and performers of high calibre. It also helped me communicate my ideas at a local, national and international level. The benefits of this investment in me is ongoing as the work I developed during the residency continues to be performed across Ireland and internationally. As the Irish economy faces difficulty, I think there is something of immense value to be learned from the investment of the Arts Council and of Dublin City Council in the arts in general and in my work in particular. The number of outcomes, the range of employment, the raising of the profile of Irish creativity and innovation abroad are examples for how much can be achieved with limited resources. These achievements were possible because of the way that partners in the arts work together creatively and generously. They were possible because artists are resourceful and innovative. It is right to invest in these skills. I am proud of these achievements and hope that I can take what I have learned to future projects. The arts are an important resource in Ireland, for Ireland and for all Irish people and I intend to keep finding ways to encourage investment in them. Thank you again for the chance to clarify my position. I hope it helps your article. I came across Misnomer Dance Theater when I was looking at arts organisations that are working comfortably with online technology. Misnomer Dance Theater has made a name for itself as a company that exploits for dance the resources that indie bands and songwriters have successfully utilised to get their work distributed to a wider audience. For those who were reminded at the New Media, New Audiences? conference yesterday that there won’t be any extra money in Ireland for research and development in this area, it will provoke envy that Misnomer has just received a grant of $1 million to develop its model in to something other arts organisations can follow. The company’s artistic director and choreographer Chris Elam may have had a head start in all of this in that he came to dance while he was studying public policy and computing at university. But that just reminds me that you need people who are connectors and multi-disciplinary to help knowledge to flow from one area of culture to another. I did notice from reading the article that while the company will enjoy having this $1 million in the bank, that money won’t get any work made. The company will still have to fundraise for its artistic programme. And I wonder if it matters how good the communications technology and media are if there isn’t something worthwhile to communicate. I attended the Arts Council’s New Media, New Audience? conference in Dublin Castle yesterday. Going there and particularly having been invited to be on a panel, I felt a bit of a charlatan since my engagement with online media is this blog, some facebook advertising and youtube – hardly cutting edge. However, in comparison to the majority of arts organisations in Ireland, it appears that this approach is relatively novel. It was instructive that of the two keynote speakers it wasn’t the utopian Charles Leadbeater whose argument received the most vocal support from the delegates. Instead it was Andrew Keen with his focus on what is lost (mostly traditional authority structures and traditional business models) that drew audience sympathy. Is that because there were more people representing arts organisations there than there were artists? Do organisations have more investment in maintaining control over the traditional means of distribution and traditional relationships with a traditional idea of audiences? In my experience, artists just get on with using whatever resources are available to them and web technology is another set of resources. I moderated a panel with Peter Fitzpatrick, Trevor Curran, and Conor McGarrigle who were all positive about the opportunities that do exist. Trevor is already involved with producing the online teen drama Aisling’s Diary, Conor has created a body of work online, using GPS technology in particular, and Peter, who works with Microsoft (but confessed to being a Mac user too!) talked about the software and applications that are being developed that the arts sector can start to use. Even so, I realised that many people in the room weren’t aware of the concept of something like Cloud computing and I wondered how that kind of awareness (which is part of newspaper general culture now rather than specialist knowledge) might be raised. Someone said to me that he was shocked by the level of resistance to ‘new media’ (not new NOW) and thought the sector would be severely hampered by such resistance. So why do I blog? Because I want to share what I’m thinking about, what influences me, what I’ve learned; by sharing that, I want to help people have a way in to my work, to not just encounter it as a closed product but to see it as something in process, something porous. However I wonder if my invitation to participate is clear enough. Do I really make it possible or worthwhile for people to engage in dialogue? Or am I more driven by the narcissism that Keen thinks is endemic in this everyone-has-a-voice culture? The figure runs close along a stretch of tall buildings. Scurries. Hides. Evades. Makes it to bare room. Hides. Evades. Buster Keaton’s distinctive if older physicality makes the opening of this unusual Becekett film an interesting dance in the city, a body making its way against a set buildings, under surveillance from the camera. 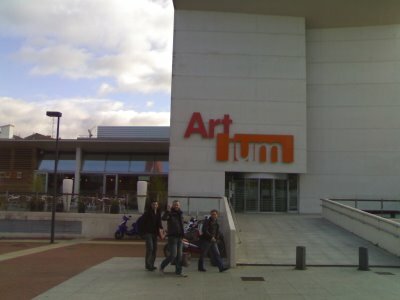 I arrived today at Artium, an unexpectedly interesting art museum in the Basque city of Vitoria. It’s the first venue of a tour called ‘A Man’s Touch’, organised by Mikel Aristgui who is Basque and who just danced in Niche. It was thanks to him that I brought Match to Bilbao this summer and now I’m back with Match and the solo from Cosán Dearg that I performed in China last year. The evening is called ‘A Man’s Touch’ because it’s choreography by men (me and Mikel) performed by men (Matthew, Mikel and me). Mikel and I both have duets and a solo to present and we finish the evening with a improv coda that brings all three of us on stage. 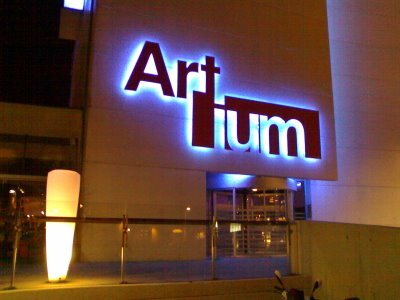 I was impressed by Artium from the minute we arrived. It’s new, beautifully designed and has an interesting collection. More importantly for us, they are welcoming of dance and though they don’t have a theatre or studio space, they have a team that transforms one of their spaces into a spacious and flexible performance venue. The lighting is limited but given that I’ve performed Match and Cosán Dearg in all kinds of technically unsupported spaces that’s not a problem. It was a pleasure to return to Match and feel secure in the reliable relationship with Matthew. Adapting to new spacing is easy in theory but it’s interesting that it takes longer for the body – my body, at least – to be assured in that adaptation. Matthew and I performed well but I was aware that we would come out of some passages of movement and orient ourselves by different internal maps that set us fractionally at odds with each other when we would come together for the next physical interaction. I don’t imagine that many will have noticed this from the outside but we are aware of the adjustments necessary in those moments of misdirection.